I subscribe to Bon Appetit magazine, and it's one of my guilty pleasures! Sitting on the couch and delving into the latest issue with nothing to distract me is pure loveliness. Some of my all time favorite dishes have come from this beloved mag. This pizza especially has been a favorite, as well as many other recipes. There is always a recipe or two, and sometimes three that get ripped out of the magazine and make their way into my bulging recipe book to be cooked sometime in the near future. Well this Korean Bibimbap recipe made it all of two days before it was a must to be made at my house. This is how it went. I sat down and read the mag, and consequently ripped a few pages out from between the covers. Those said pages made it to the kitchen where my oldest son saw them and immediately BEGGED for this recipe to be made. I will say I was smitten as soon as I saw the picture of this dish, but I didn't quite expect the reaction I got from my kids. So needless to say I made the recipe the next day, and dang it, it was a HUGE hit!! If I can just say, it was soooooo stinking good!! As James was eating he said, "This is definately a keeper. Something you need to make quite often." Exact words! We loved it. 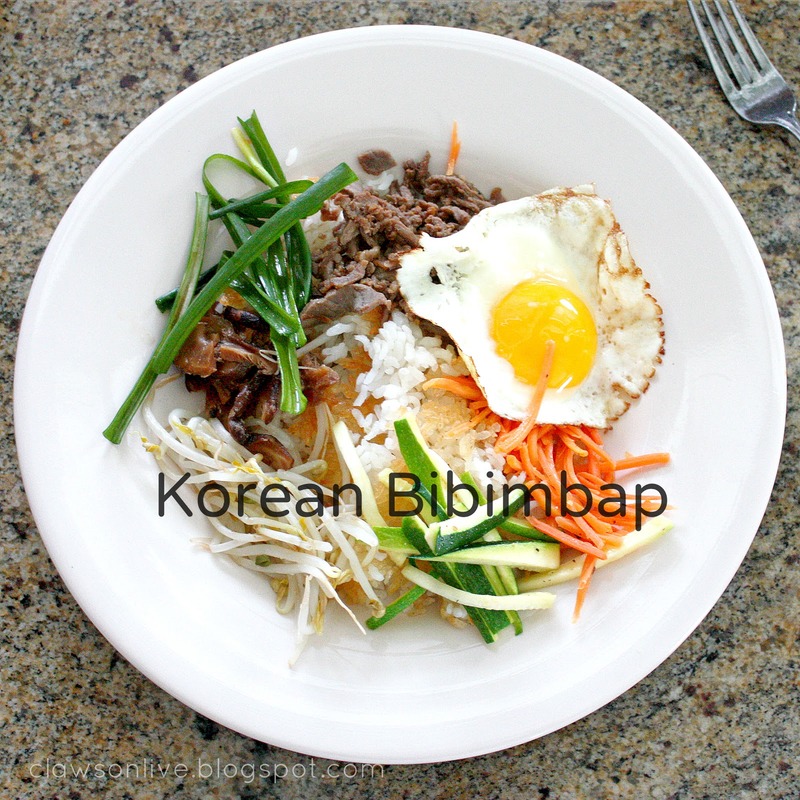 Bibimbap (비빔밥, Korean pronunciation: [pibimp͈ap̚]) is a signature Korean dish. The word literally means "mixed rice". Bibimbap is served as a bowl of warm white rice topped with namul (sautéed and seasoned vegetables) and gochujang (chili pepper paste). A raw or fried egg and sliced meat (usually beef) are common additions. The ingredients are stirred together thoroughly just before eating. It can be served either cold or hot. Well we ate it hot, and it was splendid. There is nothing strange, odd, or weird in this recipe. Just a wonderful mix of fresh veggies, meat and rice. Amazing!! I can honestly say I have never had anything Korean before. I'm a little scared of Kimchi, but who knows, maybe I'll try some. Since Bibimbap is so good I'm sure Kimchi would be too. Bibimbap Mix-Ins Click here for a link to all the veggie recipes. I'm so excited to try it! I'll be in touch soon to work out our family's dishes!